A dinner cruise is the perfect romantic getaway for you and your special someone. Dine on luxurious tasting menus or unlimited buffets while floating on the Chao Phraya river, slowly sailing through the middle of Bangkok. Your food will be accompanied by the beautiful sights of the Grand Palace, the Temple of Dawn, and so much more. Many of the cruises also have live music playing to set the mood for your perfect night. The Apsara dinner cruise will take you along the Chao Phraya river aboard the traditional Thai vessel, the 'Apsara'. While feasting on a scrumptious four-course dinner, you will be able to enjoy the glorious sights of the Grand Palace and the gleaming Temple Of Dawn. With rich curries, fantastic soups, and delightful desserts, you will get to sample the very best of Thai cuisine. The Wonderful Pearl is one of the newest, most significant, and most advanced dinner cruises in Bangkok's Chao Phraya River. Alongside the delicious buffet consisting of Thai, Japanese, and European cuisine, enjoy the magnificent views from the River of Kings while listening to the smooth jazz tunes belted out by the live band. Once your meal is complete, you get to see a Classical Thai Masked Play, right aboard the ship. Supanniga is the luxury dinner cruise brainchild of the owners of Bangkok's Supanniga Eating Room, an award-winning restaurant well known in the city. Once aboard, you will be greeted with a glass of Taittinger Champagne. Soon after, your six-course meal begins, with each course having its own story to tell showcasing the nuances of Thai cuisine. Pick your choice of speciality cocktails to accompany your meal, or asks for the chef's recommendation. This romantic dinner cruise is perfect for you and your significant other. Enjoy a candlelight buffet amidst the illuminated Bangkok skyline with live music and hand-made cocktails. This cruise also includes pick-up from and drop-off to your hotel. With all the inclusions, it is excellent value for money. The Horizon Dinner Cruise is operated by the renowned Shangri La Hotels and Resorts Company from Hong Kong. Once you step aboard the luxury vessel, you will be blown away by the spectacular attention to detail. On the upper deck, you will get 360-degree views of the gleaming Bangkok skyline. The best part, however, is the delicious buffet serving traditional Thai cuisine as well as an assortment of international dishes. The Arena River cruise is unique in the fact that it serves up traditional Indian cuisine. Treat yourself to delectable curries like Paneer Tikka Masala and Tandoori Chicken. The vessel is a refurbished rice barge that has a very classy vibe to it. While dining on your favourite Indian dishes enjoy live Indian music as well as a DJ after your meal is complete. The Grand Pearl Dinner Cruise will take you aboard one of the three Grand Pearl cruise liners over the Chao Phraya River. You get to view the Wat Arun - Temple of Dawn, The Grand Palace and the Wat Pra Kaew - Temple of The Emerald Buddha at the right time of the evening with all the lights glowing up these beautiful structures. Thai & International Cuisine Dinner is served under moonlight, with Live Music in a serenade atmosphere and a Thai Classical Dance Show. A luxury rice barge journey into Thai culture and the Thai heart. Five-star dining, traditional culture and touring, on the original antique teakwood rice barge on the river in Bangkok. Experience Thai hospitality and delicious food from around Thailand in the comfort and tranquillity of this luxury, open-air cruise in Bangkok. The Manohra Cruises are a fleet of restored antique rice barges, built with elegant teak wood and crafted in the traditional rua krachaeng style, meaning ‘boat with canopy’. These deep-hulled hardwood vessels were once the primary mode of transport on the river. 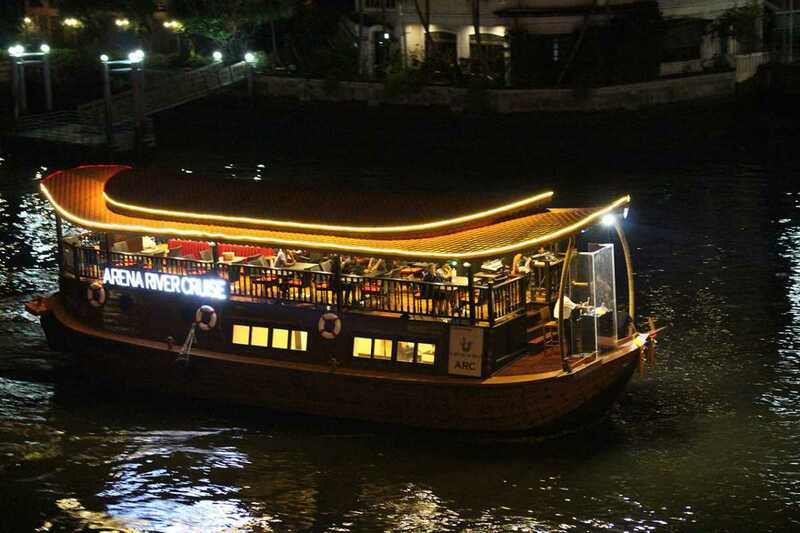 A Dinner Cruise is the perfect date night during your stay in Bangkok. With such fantastic food and the most spectacular views, there is nothing more romantic than an evening on the Chao Phraya river.